To ensure the technical quality of the pellet sector, the European Pellet Council decided in January 2011 to take action and develop the ENplus certification, which was first introduced in Germany in 2010, and to take it to the international level. The ENplus quality certification is a major step towards establishing pellets as a widely used energy commodity. For the first time, numerous national standards and certifications were replaced by one uniform system based on international standards for wood pellets. A key advantage of ENplus is that pellet quality is managed throughout the entire supply chain including production, storage and transport all the way to the end consumer. 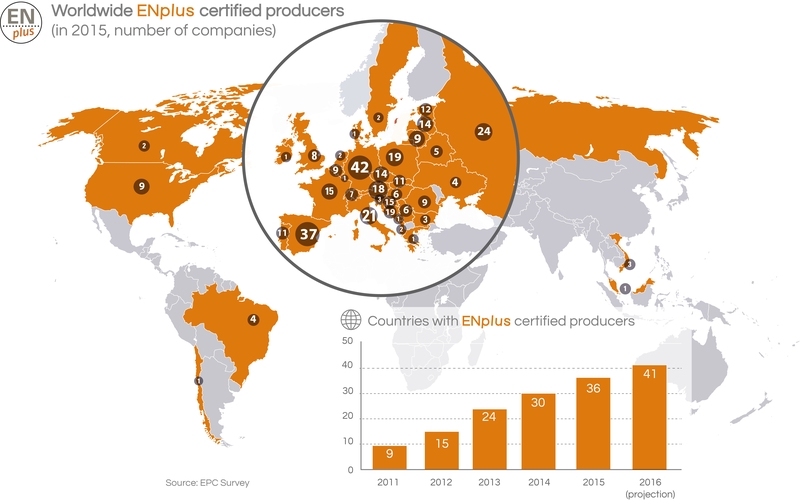 Since its launch, the ENplus certification benefits from the support of a large part of the European pellet sector. As of July 2016, pellet producers from Albania, Austria, Bosnia & Herzegovina, Belgium, Bulgaria, Brazil, Belarus, Canada, Chile, Croatia, Czech Republic, Denmark, Estonia, France, Germany, Greece, Hungary, Israel, Ireland, Italy, Latvia, Lithuania, Luxembourg, Montenegro, Malaysia, Poland, Portugal, Romania, Russia, Serbia, Slovenia, Slovakia, Spain, Sweden, Switzerland, The Netherlands, Tunisia, Ukraine, United Kingdom, United States and Vietnam are producing ENplus pellets, representing over 8 million certified tonnes in a total of 41 countries on 5 continents.